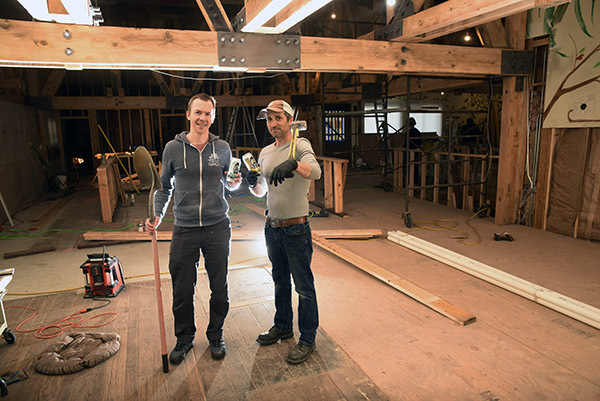 Alibi Ale Works owners Kevin Drake, left, and Rich Romo anticipate opening in early summer. After the snow melts, a well-known Incline Village building will stop being referred to as “the new location.” Its official name is Alibi Ale Works Incline Village, but most folks will undoubtedly call it Alibi Incline. And even more will say it’s pretty awesome. Live music will be featured inside and outside in an amphitheater-shaped beer garden, where 24 varieties of Alibi’s beer and cider will be served alongside upscale pub fare. 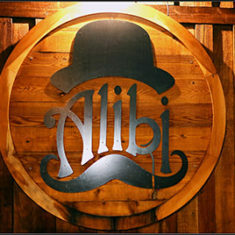 It will be the third Alibi Ale Works Brewery venue. Owners Kevin Drake and Rich Romo opened the Incline Village Tap Room in 2014 and the Truckee Public House in 2017. When Drake and Romo began the brewery, the plan was to supply Tahoe-area stores and pubs. A small portion of Alibi Ale Works Incline Brewery and Tap Room on E. Enterprise Street is a bar that became surprise success. “That’s what was paying our bills,” Drake said. Opportunity knocked for the site just up the road at 931 Lake Tahoe Blvd. The 3,500 square foot building was built in 1978 and was first used as a steakhouse. For 32-years, it was the Hacienda De La Sierra Mexican Restaurant. People won’t recognize the place when it opens early this summer. The multi-tiered building now is on a single level. It formerly was very dark with low-hanging lamps. “Grim le décor,” Drake called it. A major job was blasting the 1970s Tahoe chestnut beams down to the wood. The room is centered with a square bar that will have room for 25 stools. There are three open yet singular areas. The room at the entrance will have three large booths at the southern wall. The eastern area will can be adorned with folding tables that can be arranged for myriad settings. For music, which will be featured two to three times a week, the largest area can be used as a dance floor. There will be a 10-inch high stage at the west end, set next by a closet large enough for instruments but not musicians – call it a green room for gear. “Tell Kevin if he wants blues in the place, I’m available,” said Mighty Mike Schermer, a nationally renowned artist who lives part time near Tahoe. A sure-to-be popular summertime gathering spot is an outdoor deck. A beer cooler will house 48 barrels – 24 on on either side, one tapped to the bar on the deck, the other side flowing underneath the floor to the indoor bar. Steps from the deck lead down a hill to a fenced area that resembles a small music amphitheater. There will be a fire pit. Children and dogs will be welcome. The kitchen is being renovated, too. Drake said working folks around the village will be able to come in and out for lunch in an hour. The original brewery likely will be open for the public only on Saturdays. The Truckee location is the Grass After Dark venue for WinterWonderGrass. Alibi Truckee, officially but seldom called Alibi Ale Works – Truckee Public House, is located on Bridge Street in the old town area. 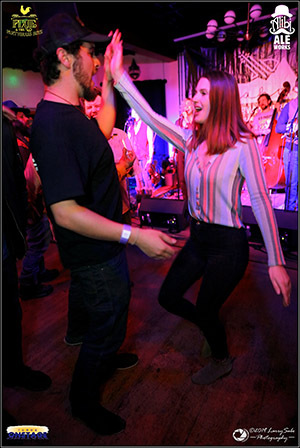 It quickly became a popular community venue for benefits, and special events such as Latin dance classes, Knit and Sip, comedy shows and Monday night bluegrass open mic jams. Live music is emphasized more than anything other than the beer. Top bands from North Shore, Reno and even Grass Valley/Nevada City regularly play at Alibi Truckee, including Ike & Martin, Earles of Newtown, Metal Echo, Mojo Green and the Dead Winter Carpenters, which had a three-night run during New Year’s. “We’re always throwing a party,” Drake said. Music in the area exponentially increases with the new Alibi Incline, which could draw from South Shore and Carson City. “If the experience is good, they’ll come,” Drake said. Will they have any wine ? It sounds like such a great place but I don’t like beer . I bet there will be something else .. Yes we will have something for everyone. Wine list, Cider, kombucha, craft sodas, craft cocktails.